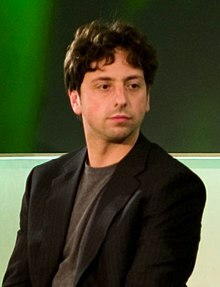 Sergey Mikhaylovich Brin (Russian: Серге́й Миха́йлович Брин; born August 21, 1973) is an American computer scientist and internet entrepreneur. With Larry Page, he co-founded Google. Brin is the President of Google's parent company Alphabet Inc. As of June 2018, Brin is the 10th-richest person in the world, with an estimated net worth of US$52.1 billion. ↑ "9 top executives with $1 salaries". CNN Money. August 6, 2013. Retrieved August 11, 2015. ↑ "Profile Sergey Brin". Forbes. ↑ "Sergey Brin profile". Forbes. Retrieved January 24, 2018. This page was last changed on 22 March 2019, at 03:13.